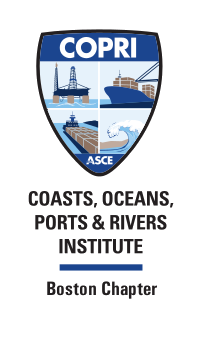 The mission of the COPRI Boston Chapter is to serve our membership through improving knowledge, education, development and practice of civil engineering and other disciplines in the sustainable management of coastal, ocean, port, waterways, riverine, and wetlands resources for the benefit of society. Sponsor powerful programs with impressive and knowledgeable speakers. Each program shall become a forum for stimulating discussion that provides useful engineering and business ideas as well as networking opportunities. Topics focus on sustainable development, protection and restoration of our coasts, oceans, ports, waterways, rivers and wetlands. We have found the wealth of knowledge and genuine interest in our profession exhibited by our membership to be unparalleled. If this area of practice interests you, please consider participating in COPRI Boston Chapter, and contact the chair for more information. The committee meets approximately once every 2-3 months. Please see the events calendar or contact the chair for further information.